Meat gets all the hype when it comes to barbeques – type in any bbq recipe and up will pop homemade burgers, ribs, slow cooked pork and so on, there might be a little side not to a vegetable kebab which consists of tomatoes, red onion and halloumi. 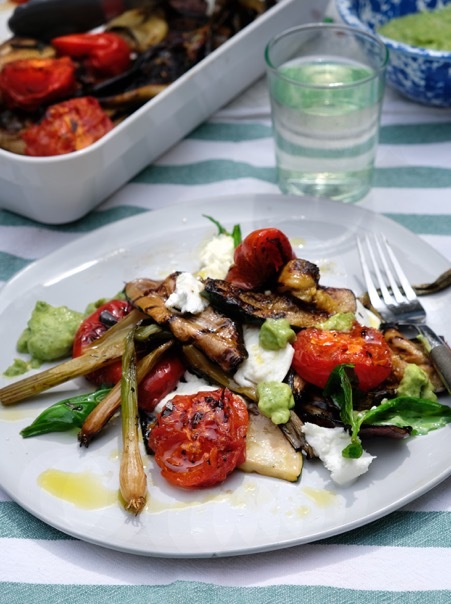 Although both of us are great meat and fish lovers sometimes we are cooking for a more veggie crowd or we are simply craving a big plate of deliciously charred, juicy, bursting with flavour vegtables. We are constantly in owe of Gill Meller who seems to spend his time outside cooking over an open fire – a true expert (or check out the Argentinian chef Fancis Mallmann), we are still learning and having great fun at that, learning different techniques with different types of bbq’s and different flavoured woodchips – we are really into our woodchips. Jemima has the all singing all dancing Big Green Egg barbeque which we feel you need to have a degree to understand how to work but once you have the hang of it then wow its incredible, you can even cook pizzas in it – it is really an outside oven, it’s made of clay which keeps the temperature very accurate for a long period of time so you can slow cook in it, it’s a fantastic piece of kit but comes at a price! For todays recipe we are using Lucy’s bbq which is a charcoal Weber, its brilliant and comes with a special chimney for lighting the coals which makes the whole thing very easy (neither of us are naturals at the bbq and would usually leave it to our other halves so thrilled to find anything that makes the process easier), we highly recommend it and is a fraction of the price (it’s a good old fashioned looking charcoal kettle). We started cooking with woodchips when we bought ourselves a small stove top smoker a few years ago and loved experimenting with different kinds of woods – one of our favourites is smoking tomatoes with maple wood then serving it with burrata and basil – or another favourite is smoking king prawns with Alder woodchips and serving with aioli – they are truly fantastic. Buying woodchips is easy, you can find on Amazon or many specialist sites, just make sure that they are natural and untreated. The trick when using wood chips is soaking them for about 15 minutes before using, then once the coals are ready just throw a couple of handfuls of the woodchips onto the hot coals. You can use woodchips on a gas BBQ by putting them on a metal tin or tray. Put your veggies on the grill then close the lid so the smoke can infuse. This dish can either be served as the main event or is wonderful all piled onto a sharing platter as a side, just add more vegetables for the more guests you have! Yes its simple, but sometimes simple is best. 1. Make the sauce – put everything in the food processor and blend. 2. Pick the vegetables that you want to use, try to use at least 3 if not all 6. Place in a large shallow dish, drizzle in olive oil, add the sliced garlic, basil and season – toss till all is coated, cover with cling and leave to one side to marinade. 3. Light the BBQ. Take a couple of handfuls of the maple wood chips and place in a bowl, cover with water and leave to soak for 15 – 30 minutes. Once the coals are ready drain the woodchips and take a handful or two and throw onto the hot coals. Take the veg and put on the coals, shut the lid. After 5 minutes turn the vegtables and close the lid again till ready, take out and pile nicely onto a platter, repeat for the rest of the vegetables. When ready to serve drizzle over the avocado salsa and tear over the mozzarella, season with salt and pepper and serve.